The Institute of Italian Studies - Lakehead University is proud to support the reseach effort of LU's highly regarded anthropology professor Dr. Carney Matheson. His latest research project takes him to Bolzano, Italy where Europe's oldest living mummy, "Ootizi the Iceman" is located. Accompanying him to Italy will be his research assistant Margaret-Ashley Veall. Upon his return, Dr. Matheson has agreed to present his findings as part of the Institute's Speaker Series. We wish Dr. Matheson much success with this presitigous project and look forward to his comments upon his return. Lakehead University Anthropology Professor Dr. Carney Matheson and one of his former students recently travelled to Bolzano, Italy to study the weapons and tools found with Europe’s oldest frozen mummy, Ötzi the Ice Man. Ötzi was discovered in 1991 by two German hikers in the Italian Alps. The frozen mummy was so well-preserved that police were called to investigate the discovery as a homicide. At 5,300 years of age, Ötzi lived during the Neolithic Age and is Europe’s oldest natural mummy. Previous examinations of Ötzi’s tools revealed DNA from the blood of four humans. Technology found in Ötzi’s possession, such as medicinal fungi, has not been found elsewhere in the Neolithic Era. “Our work is a fascinating forensic investigation around the last moments of Ötzi’s life,” explained Dr. Matheson. The Institute of Mummies and the Iceman, and the South Tyrol Museum of Archaeology requested that Dr. Matheson replicate analyses of blood traces on the mummy’s equipment and clothing performed by Dr. Matheson’s former supervisor, Dr. Tom Loy, a researcher at the Institute for Molecular Biosciences at the University of Queensland, who died before his results could be published. “There are many publications on Ötzi looking at him from all angles, however Dr. Loy was the only researcher to examine the mummy’s tools. Ötzi’s tools and equipment could be the key to everything,” Dr. Matheson said. Dr. Matheson’s research team travelled to the South Tyrol Museum of Archaeology, where the 5,300-year-old Ice Man is housed, in Bolzano, Italy earlier this year. His team examined approximately 20 artefacts found with Ötzi’s body, including hunting equipment, a first aid kit, medicinal items, and clothing. Dr. Matheson brought equipment from Lakehead University to perform biochemical analyses of residues found on the artefacts, and to bring samples back to Canada for further study. A major supporter of this historic research endeavour was the Institute of Italian Studies-Lakehead University (IIS-LU), which helped fund and equip the research team. Crupi Consulting Group provided shirts and lab coats which identified that the researchers were from Lakehead University and the Institute. Dr. Matheson and IIS-LU intend to host public lectures to share their research findings and Ötzi experience with the community. Dr. Matheson and Veall are available for interviews. 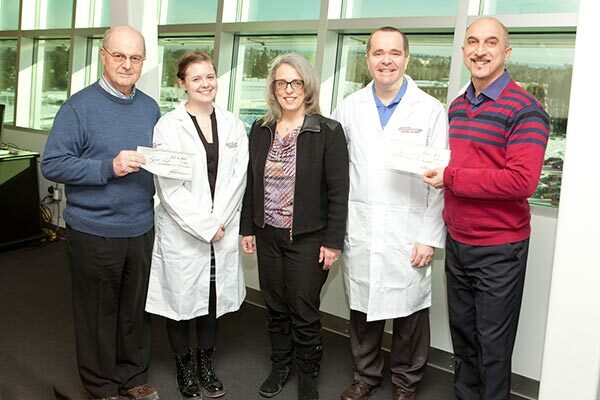 Photo 1: Roy Piovesana, far left, IIS-LU President, and John Bonofiglio, far right, Vice-President of IIS-LU, presented cheques to Margaret-Ashley Veall and Dr. Carney Matheson. In the middle is Laura Craig, Director of Research, Crupi Consulting Group. Photo 2: Dr. Carney Matheson and Margaret-Ashley Veall examined a grindstone surface. faculty and staff learn and work in ten faculties at two campuses, in Orillia and Thunder Bay, Ontario. Home to Ontario’s first new Faculty of Law in 44 years (Fall 2013) and the Northern Ontario School of Medicine's West Campus, Lakehead is among Canada’s Top 10 undergraduate universities (2014 Maclean’s University Rankings), as well as 1st in Ontario and 2nd in Canada for its innovative research (Re$earch Infosource). Our Orillia campus is the first in North America to be built entirely to Leadership in Energy and Environmental Design (LEED®) standards. Share your Lakehead story as it relates to our Strategic Plan at www.lakeheadu.ca/presidents-office/nurturing-passion, and learn more about Lakehead at www.lakeheadu.ca.